Orchestrating the transition to a new organizational culture and work environment. Companies everywhere are scrambling to adapt to a more global, mobile, and collaborative business model. Few companies, however, are taking advantage of these changes like Vodafone, the world’s leading international mobile telecommunications group. 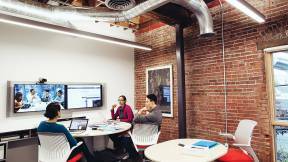 A critical factor is how they’re creatively using space to nurture a new work culture. 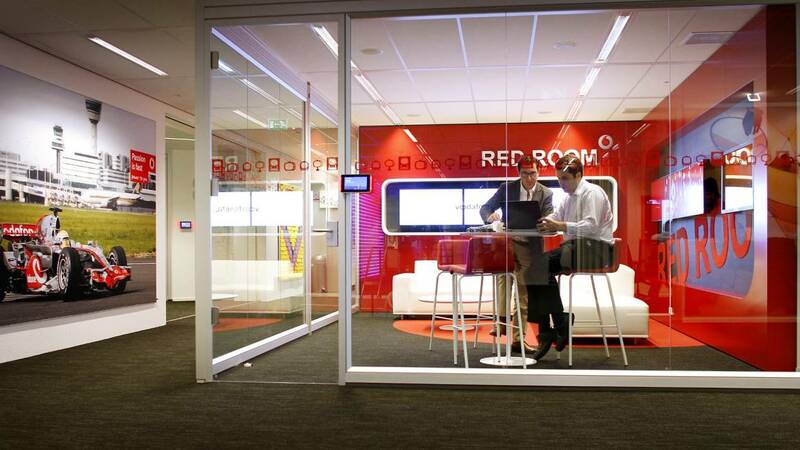 When planning to move its Netherlands headquarters to Amsterdam, Vodafone leadership wanted the workplace to exemplify a mobile workstyle, leverage the power of place for collaborative knowledge work, attract and retain top talent, and demonstrate the company brand. 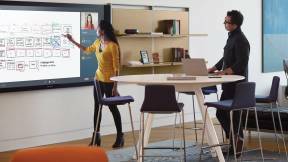 Vodafone partnered with Steelcase Applied Research & Consulting (ARC), the global work and workplace consultancy, to assist them in this major transition in their work culture and in embracing alternative work strategies (AWS). These changes would be implemented at a new workplace in QPort, a beta site where they could refine their workplace strategies in preparation for building permanent offices in Ode, another part of Amsterdam. AWS address mobility, wireless technology, and knowledge work in ways that both maximize real estate and help workers be most effective, but these new approaches drive major changes in the organization and raise a critical question: how much change is the organization ready and able to make? Working with Vodafone management and staff, the ARC team used a series of proprietary diagnostic and user engagement tools to measure the company’s readiness and willingness to embrace change in work processes, technology, human resources, and work space. 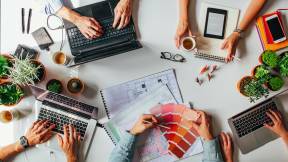 Using the insights gain through the ARC tools and processes, Vodafone’s global space standards, as well as learnings from the global real estate group the team created a new workplace strategy—and a remarkable new workplace. Our new space is both a working office and a test facility for our permanent Amsterdam workplace opening in two years,says Smits. A major marketing campaign for the company coincided with and supported the work transition program. “Hallo Amsterdam” promoted Vodafone’s presence in the city by saying “hello” to specific Amsterdam icons such as the Vondelpark, Anne Frank House, Paradiso, Leidseplein, etc., and to individu­als: “Hallo innkeeper,” “Hallo top talent,” etc. The campaign helped establish Vodafone’s presence in the country’s capital, attracted new talent to Vodafone, built internal staff morale, and created a lot of local buzz. 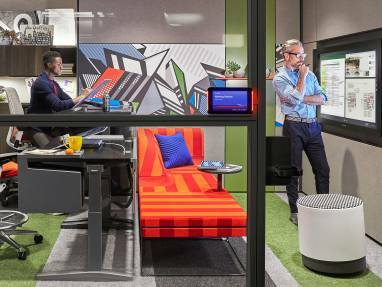 Vodafone’s transition efforts prepared workers for QPort’s dramatically different approach: no assigned workspaces, an open, collaborative layout, and everyone —from leadership to the newest workers— working from the same workspace layouts. 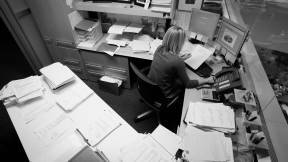 “What really surprised me was that working here was easy from the start. 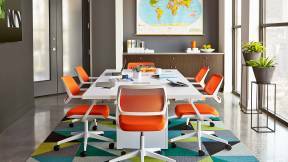 It felt good, almost natural, much more quickly than I would have thought,” says CEO Bockum, who operates from the same type of space as every other employee. QPort delivers on the issues most important to employees, from a more open and interac­tive space to a desire for colorful, well-lit workspaces, and an overall “wow space.” Yet the QPort work environment, with an average density of approximately 13 square meters per person, significantly reduces the Vodafone NL real estate footprint. The new offices have drawn much attention from both the local business community and the international facilities industry. 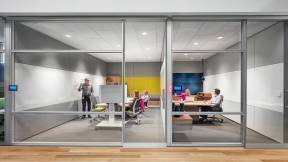 Global com­mercial real estate firm Jones Lang LaSalle gave the QPort office its Winning Workplace Award for 2011, calling it “a progressive and innovative” work environment. Outside validation is reaffirming, but QPort has an even larger internal role as a test space in preparation for the company’s move to its permanent home. “We’re observing the new behaviors at QPort and nurturing the changes in our culture. 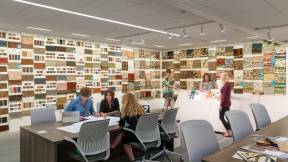 We listen to the staff and collect their ideas for ways to carefully enhance our new offices in Ode,” says Smits. 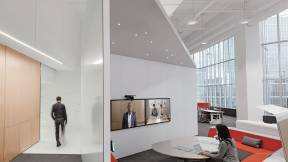 Vodafone recently created another inspired workplace, this one for its call center operation in Stoke-on-Trent, United Kingdom. 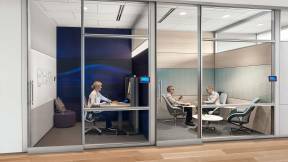 It brings together the operations of three formerly standalone call centers into one location, and uses approximately 10% less overall real estate. But even more remarkable are the dramatic differences between this facility and a typical call center. While most contact centers of this type are built with an emphasis on space compression, Vodafone created a space-efficient center that reflects their brand, facilitates collaboration between teams, and can easily adapt to future business needs: a vibrant, stimulating workplace that helps employees work better, and in turn delivers better service for customers. 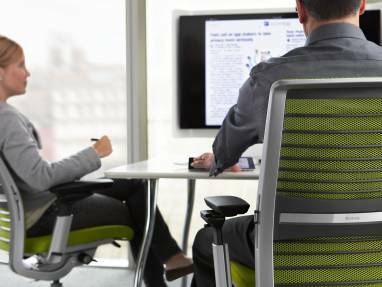 Steelcase Applied Research & Consulting worked with the Vodafone team by observing staff work processes, gathering input from employees, and synthesizing their findings to inform the workplace strategy. “We held a number of workshops with our customer advisors at Stoke asking them to talk about, draw, and even build physical models of their ideal workplace. 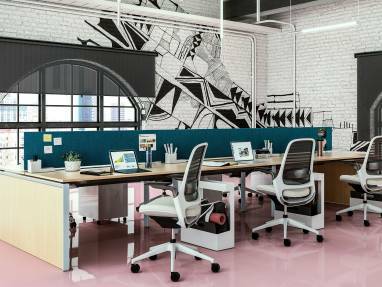 The finished work environment is very much a product of their feedback and ideas: whether it’s the style and layout of the desks, the chill room as a sanctuary from work, or the coloured portals that employees now walk through every day as they enter the building,” says Zoe Humphries, ARC team member.